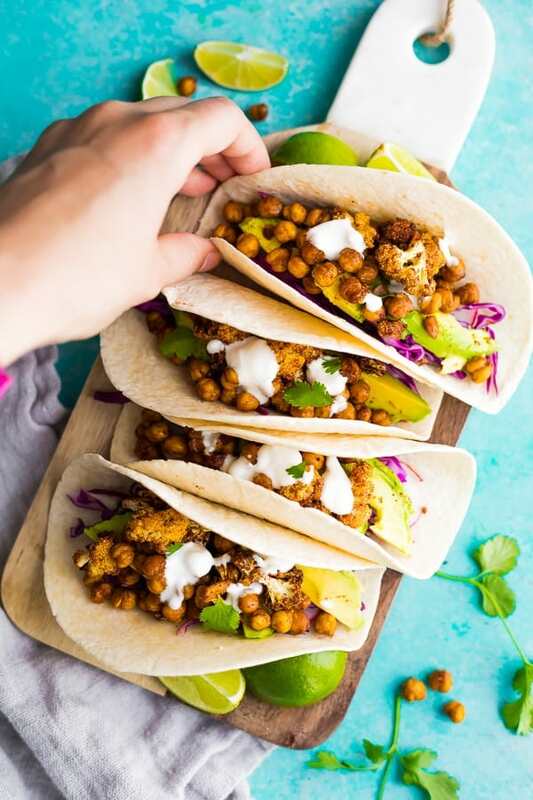 Air fryer cauliflower chickpea tacos are a fresh, flavorful, and healthy dinner to get on your table quickly. Vegan, clean eating and easily made gluten-free. 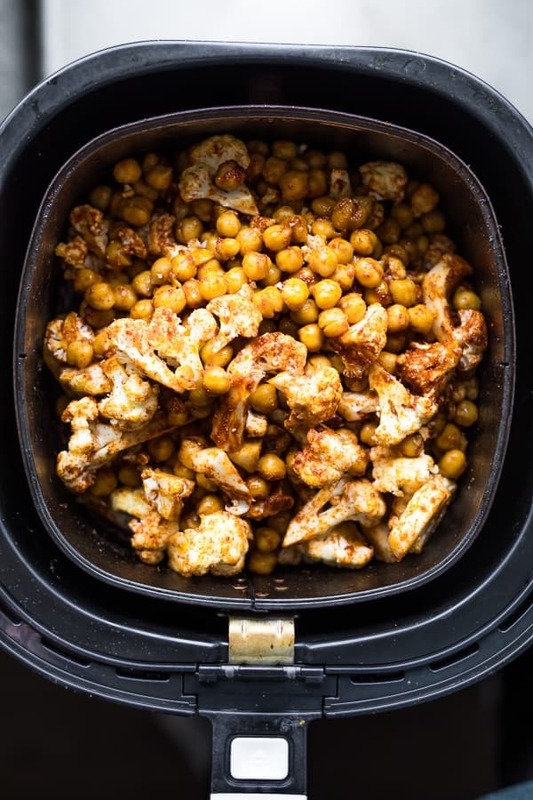 The air fryer just might be tied with our Instant Pot as ‘most loved’ and ‘most used’ appliance of 2018. While we initially bought the air fryer to make crispy, delicious ‘fried’ food, we have quickly realized it has some other perks: no need to heat up the oven (it also pre-heats a heck of a lot faster than the oven), cooks food quickly, and makes food taste deeeelish. 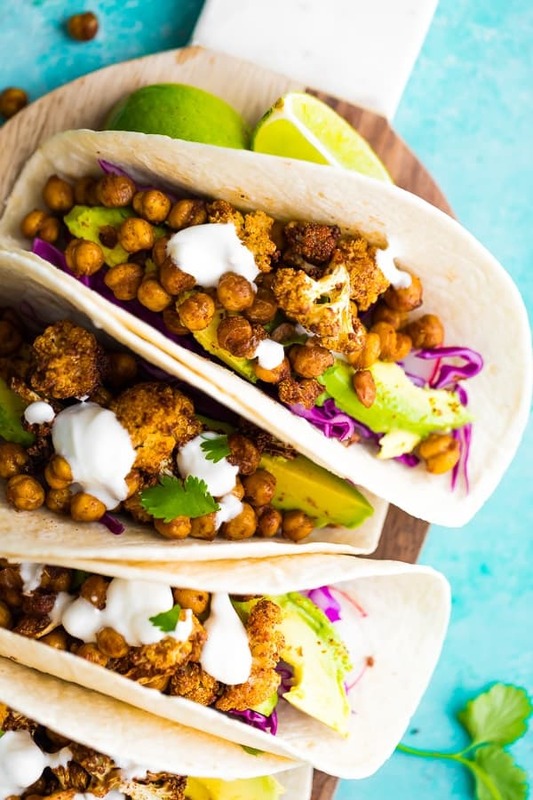 In the case of these air fryer cauliflower chickpea tacos, the cauliflower and chickpeas don’t get crispy per se (for truly crispy chickpeas check out these Crispy Air Fryer Chickpeas), but they do get that delicious, nutty roasted flavor that you get from the oven, just a whole lot faster! Toss the chickpeas and cauliflower in some olive oil and taco seasoning. You can use store-bought taco seasoning or make your own. Transfer them to the basket of your air fryer (this is the air fryer model I have), and cook for 20 minutes. Serve with fresh cabbage and avocado, and drizzle with coconut yogurt (for vegan) or regular yogurt (for vegetarian). Ta da! That’s it. Could it be any easier? I think not. 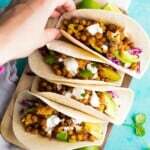 Can I prep these air fryer cauliflower chickpea tacos ahead? Yes! You can store the taco filling before or after cooking for 2-3 days. When you are ready to cook, simply toss it all back up, then into the basket. If you have already cooked the filling, it will reheat quickly (check at 5 minutes), and if you haven’t already cooked it, follow the cook time on the recipe card. 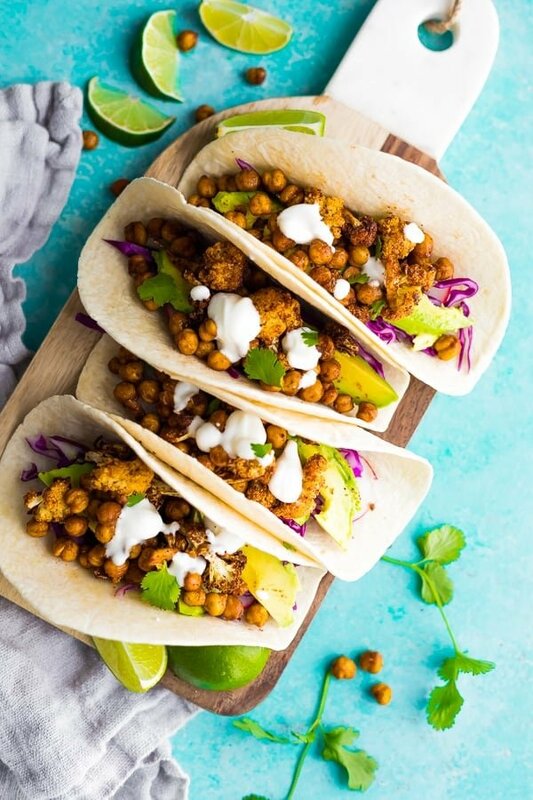 Can I make these chickpea cauliflower tacos in the oven? Yes! You can follow the same prep directions, then bake at 425°F for 20-30 minutes. Pre-heat air fryer to 390°F/ 200°C. In a large bowl, toss the cauliflower and chickpeas with the olive oil and taco seasoning. Dump everything into the basket of your air fryer. Cook in the air fryer, shaking the basket occasionally, for 20 minutes, or until cooked through. Cauliflower will be golden but not burnt. Serve in tacos with avocado slices, cabbage and coconut yogurt (or regular yogurt). What a delicious recipes you always put on your website. Do you really make them all yourself? Thank you so much! 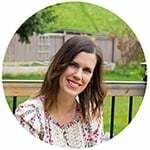 I do test, photograph and write all the recipes and posts on this site. We LOVE our air fryer! Thank you!